This is a guide I’ve developed that I find super useful with newbies to Circling – it helps convey the basic concepts quickly, so we dive deep and play more easily together, right from the start. It also allows those who are not interested, go on to something else! This guide helps those who want to know the “rules” (and eventually discover they are only guides) and allows me to more easily give feedback mid-Circling as people are learning. 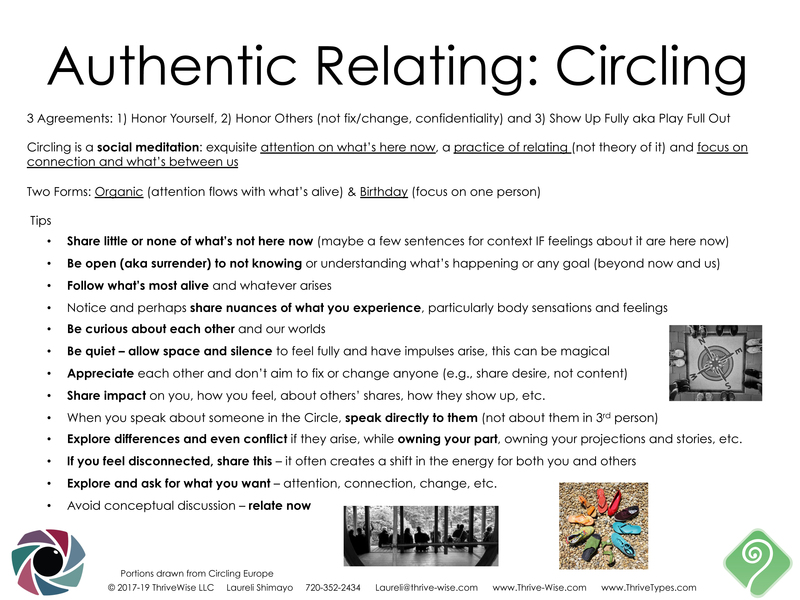 CIRCLING is a way for us to practice presence in relationship with others. It is a group experience that leaves space for individual emotional expression, reflection and sharing of impact – where we are encouraged to follow our impulses, speak our truths, and explore relating with one another authentically in the present moment. The practice of circling allows us to slow down, bring our attention to our own felt experience, and share our inner worlds with one another, noticing what happens within us and what arises within the group as we do so. The intention is to connect from a place of curiosity and to strive for clarity as we bring awareness to what is implicit and make it explicit. The goal is not to change one another, but instead to be with what is, celebrating and honoring who and where we all are right now. As we circle, we practice breaking through the assumptions and projections we may have about each other to allow for deeper connection and greater understanding to emerge.